Time of day is distinguished from time interval in that the former is a measurement of the specific interval from the beginning of a given day (such as "I started work at 8 o'clock") whereas the latter relates to the measurement of any interval of time (such as "I worked 8 hours today") regardless of when it started. Standard time of day divides the day into 24 parts called hours, which are each further divided into 60 minutes. Decimal time of day divides the day into decimal fractions, rather than 24ths. It has been used several times in history, and is used today mainly by astronomers and computer programmers. More information is available on fractional days. The Swiss watch maker, Swatch, uses fractions of 0.001 day for its ".beat" watches, which it calls "Internet Time." It divides the day into 1000 ".beats", replacing "0." with "@". Internet Time uses the fractional day for standard (winter) time in Biel, Switzerland, which is one hour ahead of GMT/UTC, so it is not synchronized with other fractional days in use. Thus, 00:00 midnight in Switzerland (23:00 UT) is @000, noon is @500, etc. Swatch claims that Internet Time is based on the meridian passing through Biel, or "Biel Mean Time" (BMT), but this town is actually about half-way between the true meridian for this time zone (CET) and the Prime Meridian (UTC). (However, Swatch's .beat watches reportedly can be set to other time zones.) Swatch does not define units smaller than a .beat, but some 3rd-party applications based upon Swatch .beats add "centibeats" or "millibeats". 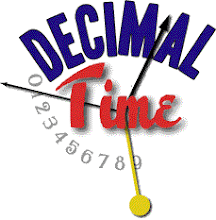 Decimal time was first used during the French Revolution. Clocks and watches were built with the hours were numbered 1-10, with 10 for midnight and 5 for noon. There were 10 decimal hours in a day, 100 decimal minutes in an hour and 100 decimal seconds in a decimal minute, so 0.98765 day = 9h 87m 65s. Many more recent proposals are based upon French decimal time.